House of Many Doors (2017) was written by Harry Tuffs, with art by Catherine Ung and music by Zach Beever and had received funding from a Kickstarter campaign. By now the initial media attention has died down and moved on to other objects of hype and typically months later I finally got around to playing it after the alpha, various updates and patches. It is heavy in style and involves reading a lot of text, with an experience mechanic that involves writing poetry, which means it is relatively dense in ideas, which is just great. But not necessarily everyone's cup of tea. Its premise is that The House is a parasite dimension that takes or has other worlds breaking through, to me the name evokes claustrophobia. The setting is able to approach various genre, fantasy, science fiction, historical fiction, through the lens of the culture of a mystical Victorian England, think deliberately or unconsciously evoking Lewis Carol's Alice in Wonderland with postmodern cynicism about the contemporary and historical assumptions of the setting. Thus you have scenes where a shell shocked soldier, from a world being invaded by "things from the skies", has had his platoon hit by a missile, somehow wound up in The House and is convinced that he is dead and in hell, is talking to a Victorian era captain of a giant mechanical centipede, and the writing conveys the conventional impressions of the limits of the Victorian mindset. It took me several attempts to learn the basic mechanics, a kind of centipede game that ratchets up tension and uses a separate tactical combat game for fight sequences, it is easy to die, even on the "Enjoyable" setting (post hoc: by now I've built up the centipede and mastered most of the mechanics). 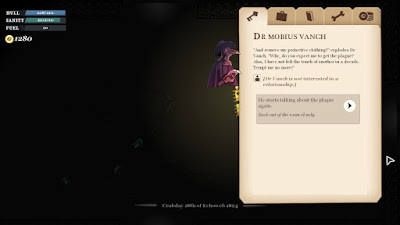 Fortunately the game automatically saves when you reach a city, there were some bugs initially, but the automatic save managed to alleviate my irritation. The map is organized in a grid like pattern with recurring setting appropriate objects with interspersed cities occupying a grid, each city evokes a particular theme, such as City of Knives, City of Masks, Eld Abrahat etc. I am unsure of its relationship to Sunless Seas by Failbetter, which apparently supplied funding, offices and advice, but I suspect the heavy text, foreboding and mystical setting for both may be traced in a lineage to the literary nonsense genre, heavy on symbolism. There is a lot of dark humour in the writing, the music conveys mood, changing the deeper you go into The House and there are auditory sound effects when the characters sanity decreases. I quite like how there is a sense of depth and distance the further from the City of Keys you go, when I was reading Emily Short's blog there were references to "Fine" and "Smiling" statuses for the sanity indicator, I haven't seen that yet, perhaps that was changed for ease of comprehension. 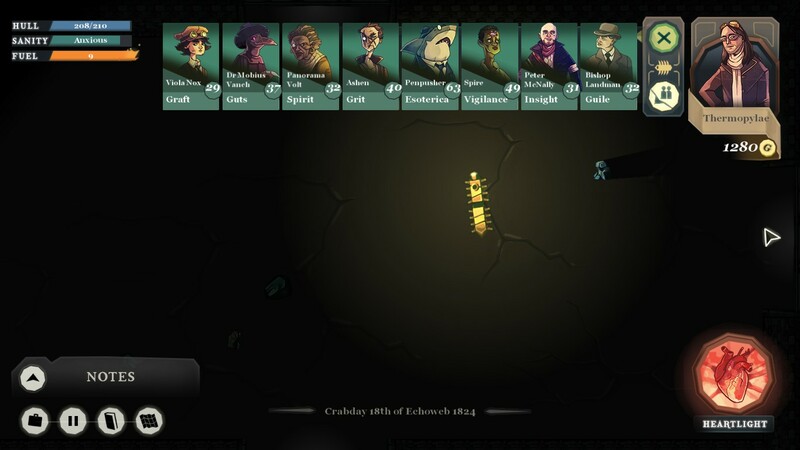 Because this is a role playing game there is an experience and stat mechanic, each upper deck crew member (a character with a picture) represents a particular skill, you acquire "apprehensions" that you spend to increase the stat represented by each particular upper deck crew member (to the right of the picture). In terms of the narrative, this represents a captain walking around his vessel reminding or assisting his officers to do their job, I have associations with this in my little world. When I initially started playing I kept on trying to find the captain's stat sheet, it is a little different conceptually from the normal character avatar in most RPGs but it kind of gels with a perceived crew narrative. By now there is a wiki which is useful for answering basic questions and finding locations to trade resources. Yes the Record Keeper is an accountant shark wearing a suit. The crew of the vessel you have in the combat game occupy particular roles including engineer, medic and gunner, and so far having the medic heal the crew during combat seems to be the best way to heal injury acquired through the narrative as well as combat damage. Both upper deck and lower deck crew members (think red shirts) have their own name in the combat screen, which is a nice touch, and the upper deck crew can be romanced in a limited way, mostly to some comic effect which produces classes of experience, which are represented as objects (there is a joke in the game about how experience can be commodified) which can be used to write poetry or spent to achieve narrative concerns. I think in a way the writing of poetry in the game may be tied to the gradual processing of experience, which is possibly one of the cognitive benefits of poetry, why people did (or do) it as a form of self expression. But, um, don't worry, I'm not going to start dashing out poetry and inflicting it on people. I was told my attempts were quite dreadful.